IBM FlashSystem A9000R is a grid-scale, all-flash storage platform designed for industry leaders with rapidly growing cloud storage and mixed workload environments to help drive your business into the cognitive era. 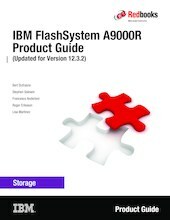 FlashSystem A9000R provides consistent, extreme performance for dynamic data at scale, integrating the microsecond latency and high availability of IBM FlashCore® technology. The rack-based offering comes integrated with the world class software features that are built with IBM Spectrum™ Accelerate. For example, comprehensive data reduction, including inline pattern removal, data deduplication, and compression, helps lower total cost of ownership (TCO) while the grid architecture and IBM Hyper-Scale framework simplify and automate storage administration. The A9000R features always on data reduction and now offers intelligent capacity management for deduplication.